BUCK X-TRACT 3080 - 0731BKX-B e folding knife with a blade. The blade is sharpened by unilaterally serrated surface at the rear end. Made of stainless steel 420 SB. UGS are synthetic kamuflirani. 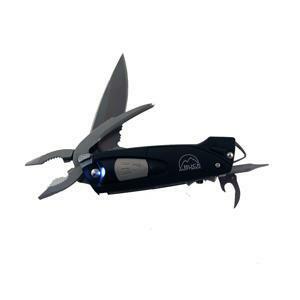 The knife and other components can be opened with one hand. It is possible to lock them to safety. The knife includes two screwdrivers, pliers, can opener, wire cutter.